Welcome to Kana'i A Nalu a quiet resort that sits on the ocean away from the road. This complex sits directly on a 3-mile stretch of white sand beach that spans almost the entire Ma'alaea Bay. This setting is wonderful for romantic sunset strolls. For the more active person this is a great beach to run on as you can do so for miles in peace away from the crowds. The west end of the beach is Haycraft Park and Ma'alaea Harbor. If there is a big south swell, the wave off the harbor, "Freight Trains," can be one of the best in the world attracting expert surfers. Towards the east of Ma'alaea is a great spot for windsurfing, during both trade and Kona winds. This property is located less than a mile walking distance to Ma'alaea Harbor and it is centrally located on the island between South and North Maui. Three miles of quiet sandy beach will entice you to walk, run, or build sand castles. The tropical water is perfect for swimming, snorkeling, surfing, or windsurfing. The lanai is the perfect place to enjoy morning coffee or tea as you watch the whales playing (December-March) or boats going in and out of the harbor. The ocean front heated pool is set in a tropical landscaped courtyard that will inspire you to relax. If youre not into swimming there are plenty of lounge chairs for reading and sunning. There are charcoal barbecues and a gas grill for you to use. Our 950 sq ft condo has two bedrooms with their own full bathrooms, all newly remodeled and finished in tropical décor. The master bedroom has a king bed, the other bedroom has two twin beds that can be pushed together to make a king bed (bedding for both options is furnished). A large sectional couch can be used for extra sleeping. There is a fully equipped kitchen that includes a washer and dryer. This unit includes a window A/C in the living room should you need it although we find it is rarely needed because the tradewinds keep you comfortable. There are 6 ceiling fans, and FREE secure Wi-Fi Internet access for your laptop and other devices. This unit is spacious and bright. The kitchen is fully stocked with dishwasher, stove/oven; linens and towels; washer/dryer inside the unit; a telephone for free calls, cable TV, and CD/stereo. This home is a wonderful value for large parties and sleeps 4 guests. We will allow up to 5 people please ask permission. Nice quiet bay! Condo was clean. "This condo exceeded our expectations. It had everything we needed to enjoy our week in Maui. It is centrally located which made it even better! Being able to hear the waves all night and watch the sun rise and set was absolutely amazing." Kanai-A-Nalu is exactly as advertised, a slice of Paradise right on the seaside overlooking Maalaea Bay.The location is great. Maalaea is small and quiet, but only 15-20 minutes by car from bustling Kihei to the east and Kahului (airport town) to the north with many big-box stores. It's also an easy drive to Lahaina.Kanai-A-Nalu is near the end of a dozen or so 70's/80s apartment/condo complexes, thus quite secluded. The horseshoe-shaped building gives every unit an ocean view. The complex is a concrete building, solid and well-maintained. The grounds are nicely landscaped (I noted a grounds crew at work every morning). There was no noise from neighboring apartments.The grounds are attractive, the pool inviting, and at least during our stay nothing was ever crowded. Kids played on the lawn, older folks lounged in the sun. We saw many other family groups enjoying the small beach just below the condo complex; we also went on long walks along Sugar Beach to the east.My husband and I visited in January 2019 with our daughter, son-in-law, and 3-month-old granddaughter. Because of the baby, we spent a lot of time at the condo. Unit #315 was lovely, sparkling clean, with comfortable, appealing furnishings and decor. 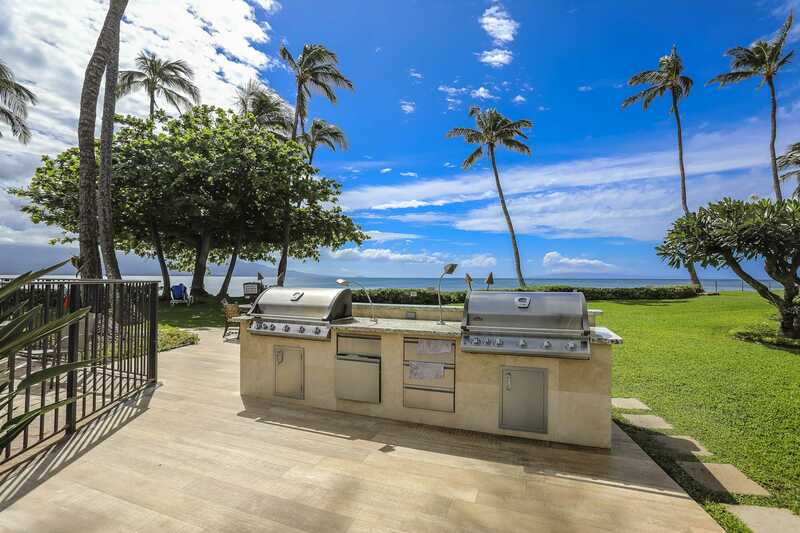 The layout (two bedrooms, two baths) was ideal.We did a lot of cooking in the well-equipped kitchen.The best part, though, was the pristine ocean view and whales aplenty to watch from the lanai (balcony). Lots of beach gear and even snorkeling equipment was provided, as well as plush beach towels, making every day a beach day. Review #24631007 "Kanai A Nalu unit 315 Ocean front ocean view! Quiet home listen to the sounds of the sea"
Outstanding location , very clean and quiet. Everything about the property was spot on will stay again thank you - Robert H.
Great location. Easy to get around to anything on Maui. Loved the sandy beach for long walks and the option of swimming in pool in the evenings. This is a nice condo in a good, central location. The immediate area has a relatively small population and has a nice "neighbourhood" feel to it. We particularly liked walking on the beach to the east of the property. The unit is well equipped with everything from golf clubs to food wrap. The leasing agent was responsive and helpful. A small downside is the aircraft noise. - Frank D.
Review #21054691 "Kanai A Nalu unit 315 Ocean front ocean view! Quiet home listen to the sounds of the sea"
Great location for relaxing with the family. Steps from a great beach and the condo had everything. First time visiting Maui and decided to pick one location for our entire 12-day stay. Very glad we selected this property! Full kitchen, stocked with all the dishes you need and a well stocked pantry of spices, which did save us a few bucks overall. Not far from either Lahaina or Wailea. Best part was how quiet it was! Kids had a blast snorkeling and boogie boarding each day (there are rocks and sea urchins so I highly recommend the 'water shoes'! ), they saw fish, turtles, and even an eel. The Maui Ocean center and Harbor Shops are right up the road; either a 2 minute drive or a leisurely walk (recommend Hula Cookies to satisfy any sweet tooth). Would stay here again. 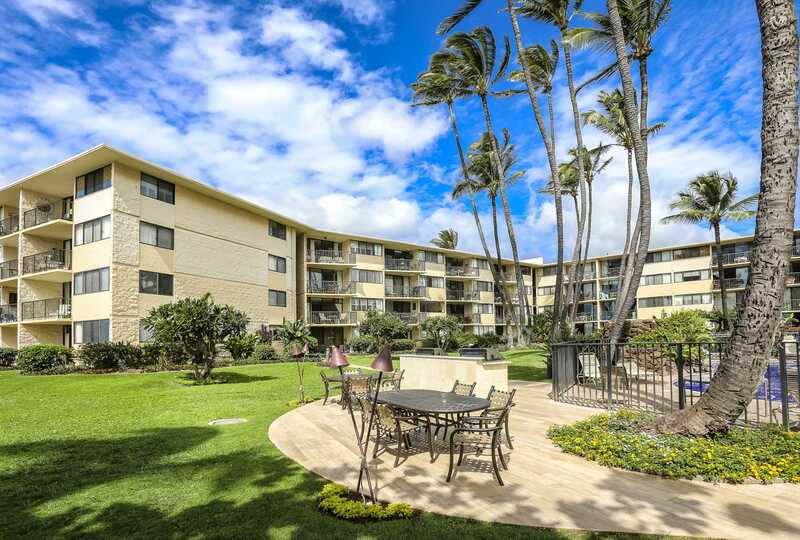 - Maureen S.
Kanai A Nalu 315 - this is our 2nd time at this condo complex and we were absolutely thrilled with unit 315. We were there for a month and after the first day it felt like home. The only issue we had was when we first arrived the internet wasn't work and Windy came over immediately and worked on solving the problem. I highly recommend this unit/complex - everything you need to cook is provided in the kitchen. The grounds are immaculate; the pool is cleaned daily, along with the gas grills. I love that it is quiet and peaceful. Walking along the beach first thing in the morning and watching the sunrise is beautiful. Location, location, location...it's centrally located making driving to various parts of Maui a breeze. I can't say enough about this Unit. Kanai A Nalu Unit #315: Clean, well-maintained, and perfect for our family of four. We were comfortable, and very pleased with this condo! Loved the view, and easy access to Kihei, and Lahaina. Although it was very windy the week we were there, the air conditioning and all the fans, and open windows cooled us. There were many extras in the cupboards and closets that made it very easy for us to live comfortably, and to enjoy extra activities like snorkeling and sitting on the beach. We definitely would recommend this condo!! We love Kanai a Nalu! Our stay in this lovely condo was fabulous. We arrived to a spotless, clean, crisp unit. This condo is perfectly equipped with the necessities and very well maintained. The owners have done a fantastic job of keeping the unit updated. The photos here do not do it justice. There are two fans in the dining/living room and one in each of the bedrooms along with an A/C unit in the living room. It was one of the hottest summers on record, so these amenities were a plus. We used the kitchen daily and did a few loads of laundry. It was our little "home" for ten days and we loved it! Extremely clean, comfortable and tastefully decorated. We can't wait to stay here again! Thank you! Kanai A Nalu #315 - Great Place! I would recommend this condo to anyone who wants to be close to the ocean, have plenty of room by the pool and who likes to hear the sound of the ocean at night. The pictures on VRBO do not do this condo unit justice. The 2nd bathroom has an up-graded shower and the main living room area furniture has a nice reclining chair in addition to the large L shaped couch. We are a family of 4 with 2 teenage children and there was plenty of room for us. During our stay several other family friends stayed at Kania A Nala and it was a prefect set-up. The Kania A Nala is smaller than some of the larger condos and we liked that. It is a quick drive to Kihei (10 minutes to the Safeway) and only a 20 minutes to Lahaina. The restaurant "Beach Bums" is in the Maalaea harbor and we liked their live music and their pork tacos. The only "con" is that the beach space directly in front of the condo unit is relatively small. But if you walk a short distance down toward Kihei there is more beach space and easy boogie boarding area. We hope to get back to Maui and will definitely look into staying at this unit again. Kanai A Nalu Unit #315 Great Place! Tranquil Maalaea Bay. Watch the whales play November thru May. Just a few steps down from Kanai A Nalu is a place with amazing snorkeling. Swim with green sea turtles in the bay.